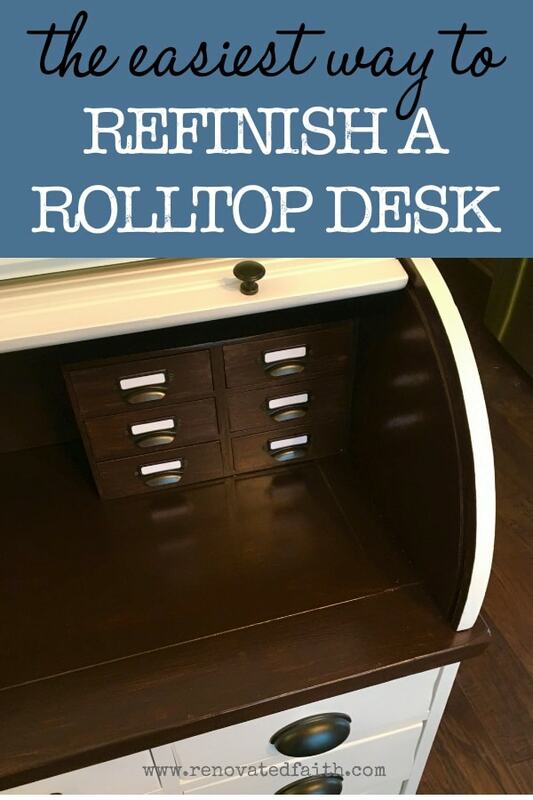 Roll top desks are such classy statement pieces in any home. It’s so rare to find one in excellent condition. They are notorious for being difficult to paint because you can easily gunk up the tambour (rolling portion) with paint causing it not to roll at all. If you are lucky enough to come across one, here are some tips for a successful transformation. Mouse Sander with low (60) and higher (180) sanding pads. 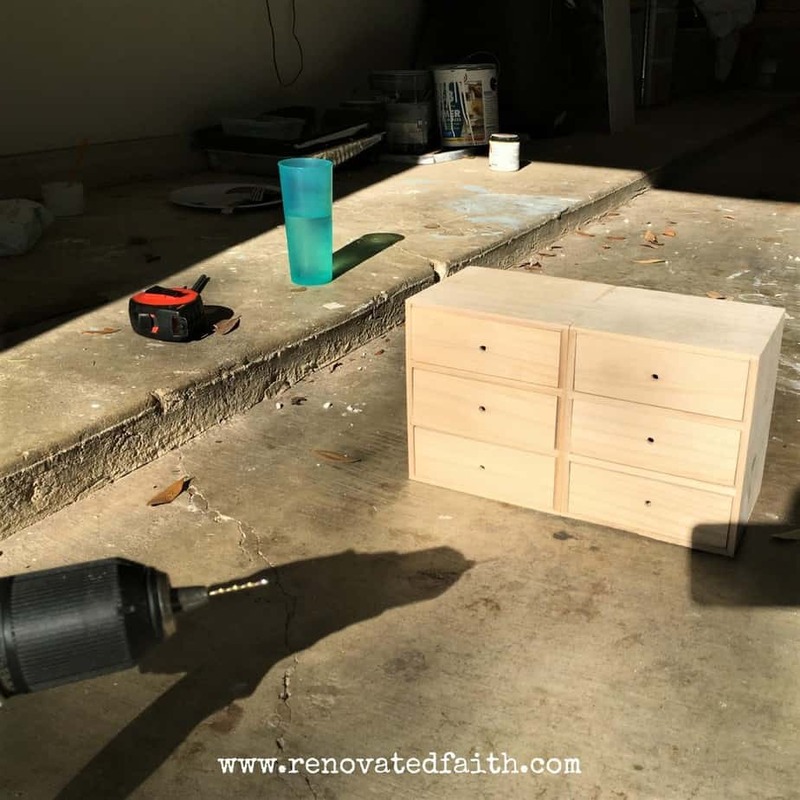 Unfinished Jewelry Boxes with Drawers (click here) – Optional. 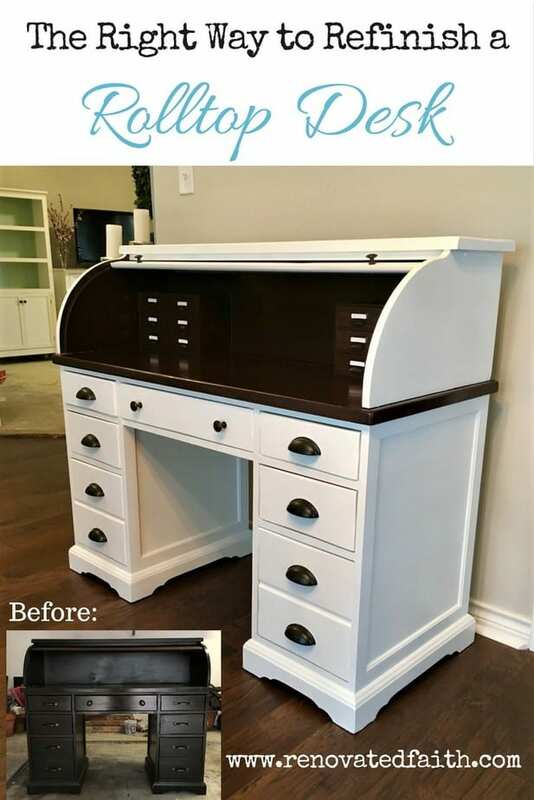 I stumbled upon this desk on a Facebook page that a friend was selling. 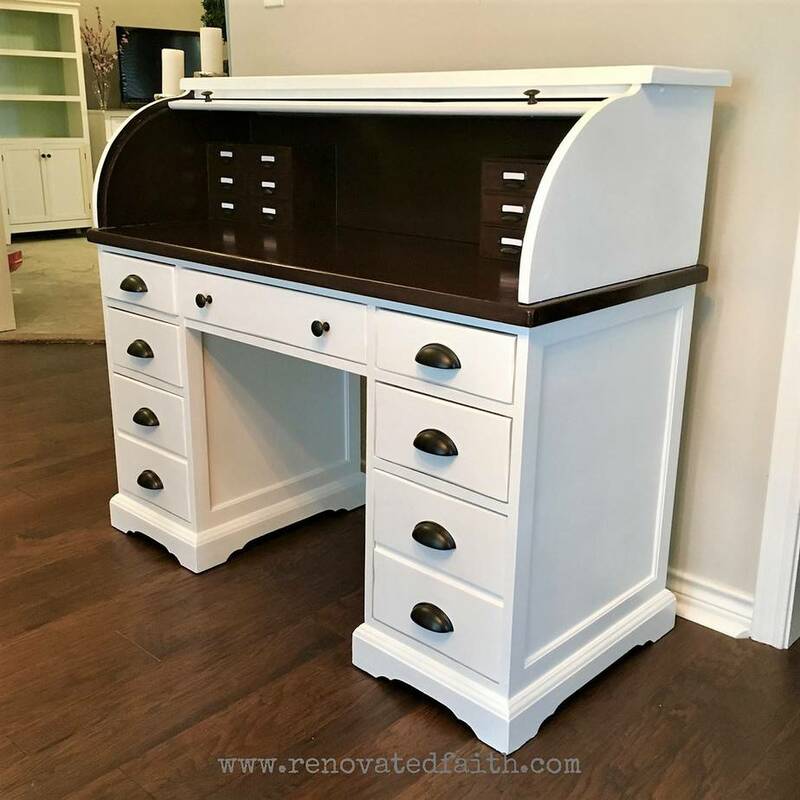 This desk was perfect to redo because the top portion comes off and the tambour just slides out making it so much easier to refinish. 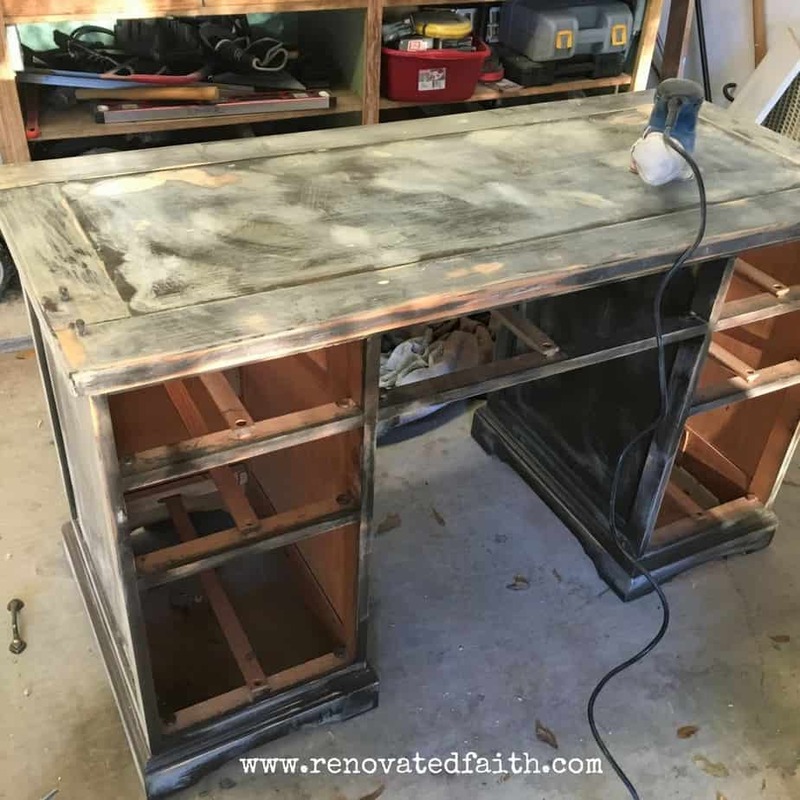 The desk was structurally in great shape but the surface needed some love. I knew I was going to sell this piece so I decided to do the surface a dark stain using my gel stain method and would paint the rest white. I realized that the plastic sleeve on both sides that the tambour slides into was already dark brown so I tried to spray paint it white to match what would be white. Let me save a little spray paint and a lot of frustration by telling you that was a horrible idea. The spray paint started peeling away when I moved the tambour up and down. It looked horrible so I spent over an hour scraping the spray paint out with a putty knife. I decided to faux stain the interior of the top to better match the plastic sleeves as there was no easy way to change their color. I took off the hardware and filled obvious holes, scratches and dents on the desk with wood filler. Sand the tambour by laying it out flat on the ground and sand as you would the rest of the desk. After sanding it was time to prime. Once again I used Zinsser 123 water-based primer. I just found out they made a spray paint version which I will have to try out on my next project. 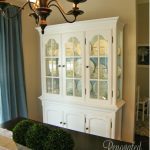 Get a nice thick coat of primer on your piece of furniture. You’ll notice that I didn’t get any primer on the groove the tambour slides into. 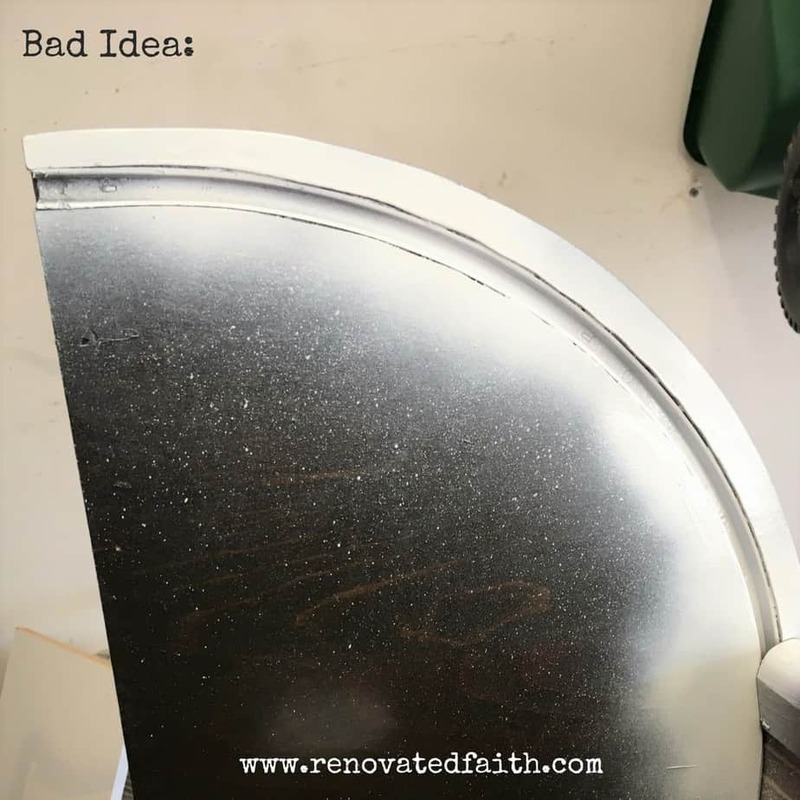 After priming the rest of the desk, I laid the tambour over a round kitchen garbage can that was on it’s side. I wanted to open up the creases so I could get primer in each crease between the wood slats. I was able to do this with a thin coat of primer. 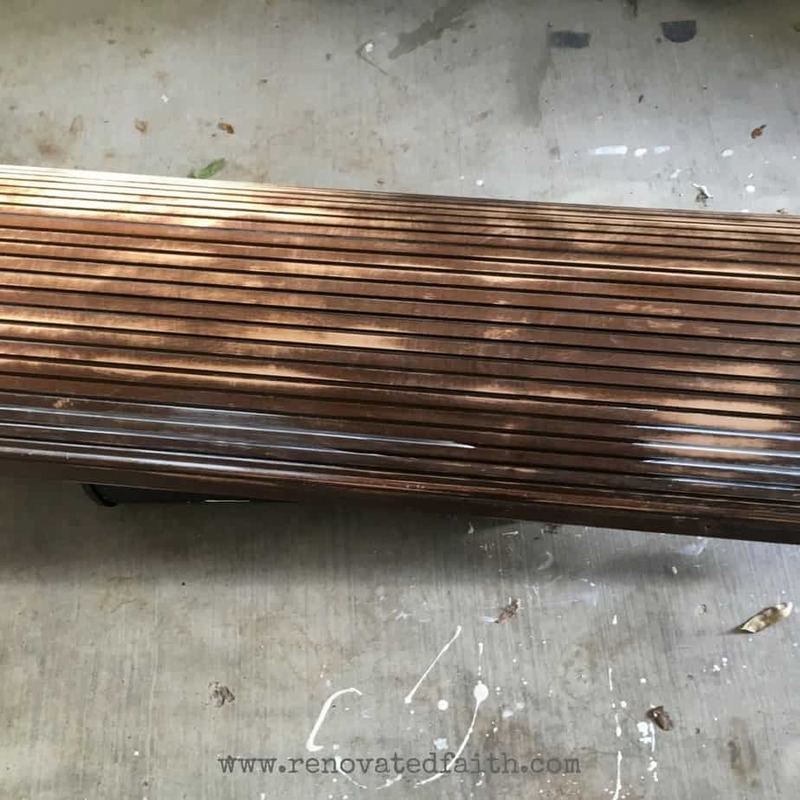 Get just enough primer to fill in the dark portion in between the wood slats. Use your brush to wipe off any excess and wipe your brush on some paper if you have too much paint on your brush. You have time to wipe off the excess before it dries. 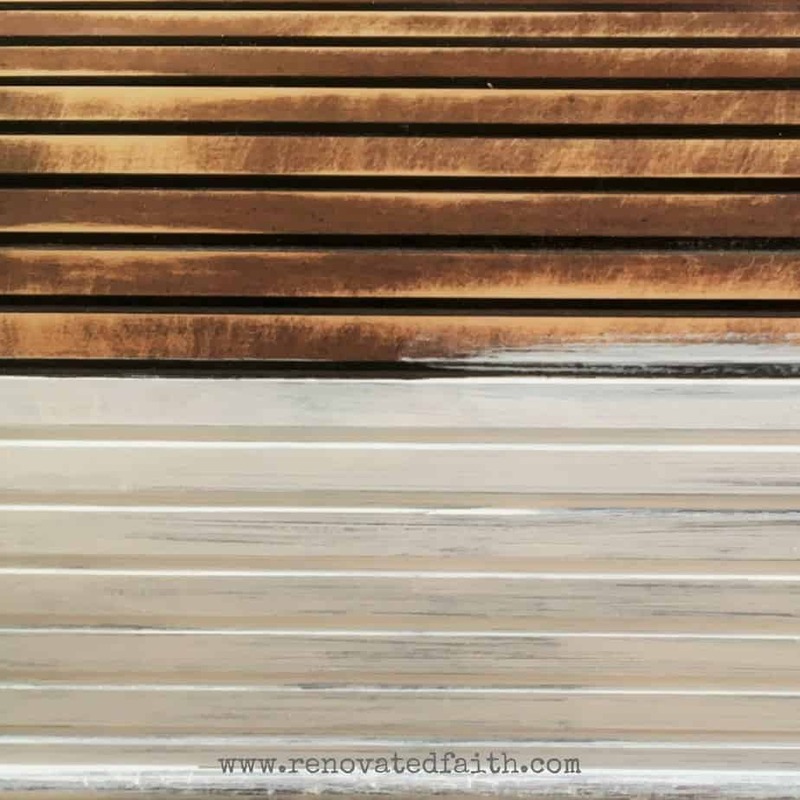 What you don’t want is a thick layer of wet, drippy paint on the tambour or the paint will crack once it dries. The Zinsser 123 Primer is perfect for this application because it is thin but clings well to the grooves while covering well. 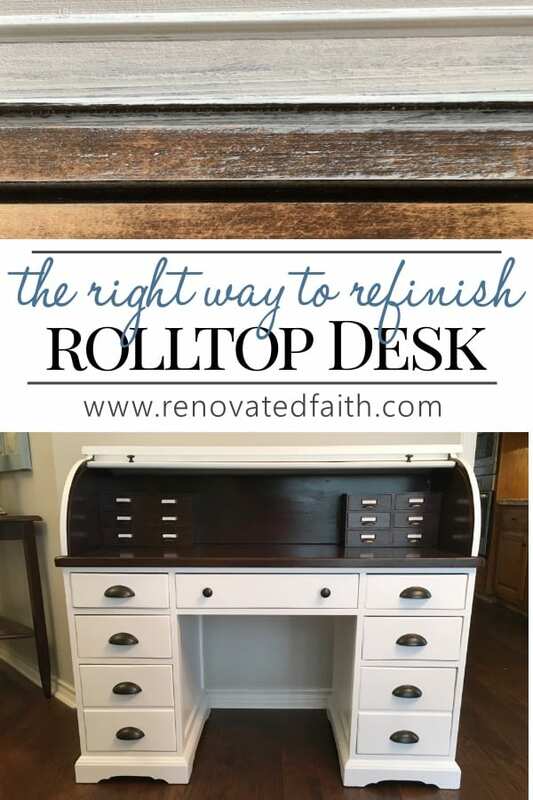 At this point, fill any remaining holes, dents or scratches on the rest of the desk. You should now be able to see them easier with the piece primed. Sand those parts after they are dry. 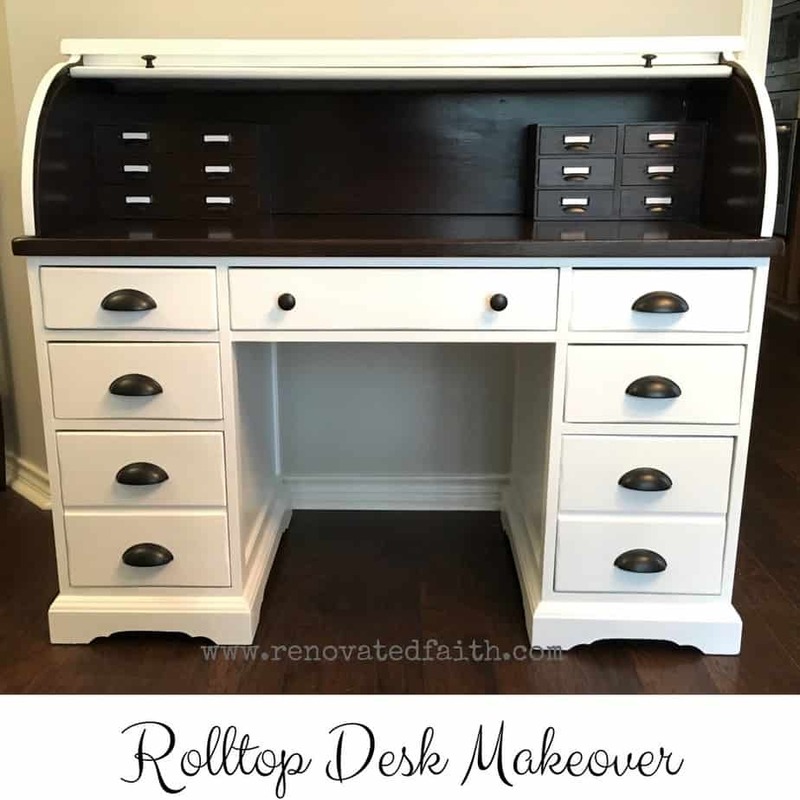 Halfway into this process, I realized that this desk didn’t have any of the cute ‘card catalog’ style drawers that you so often see on these desks. 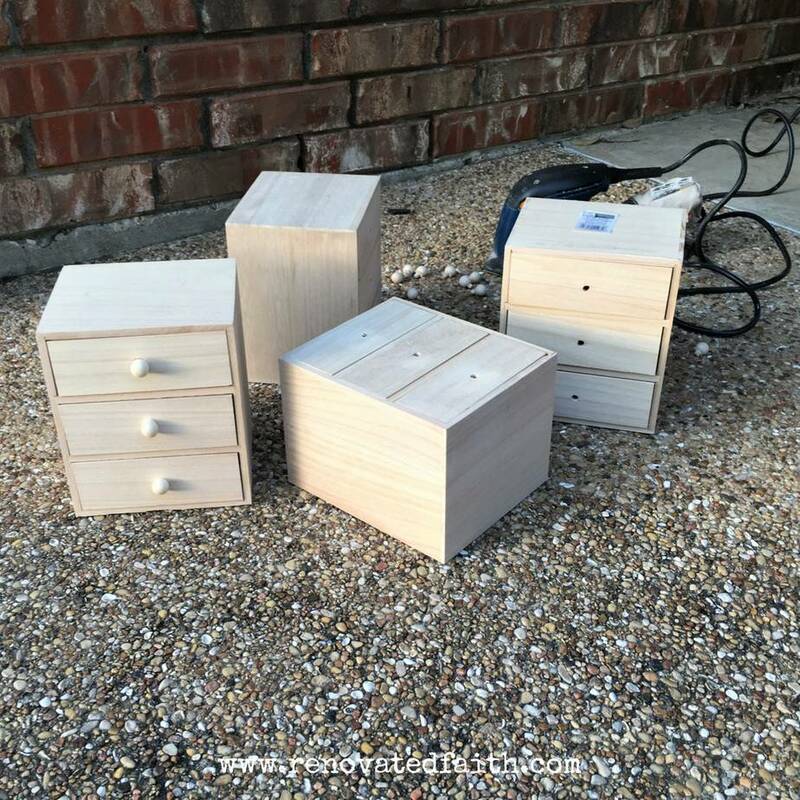 I decided to add some using some unfinished jewelry boxes I found online here. I bought two for each side and glued them together with carpenter’s glue and clamped them overnight to dry. I also pulled off the wooden knobs, filled the holes and then made holes for some cute pulls. 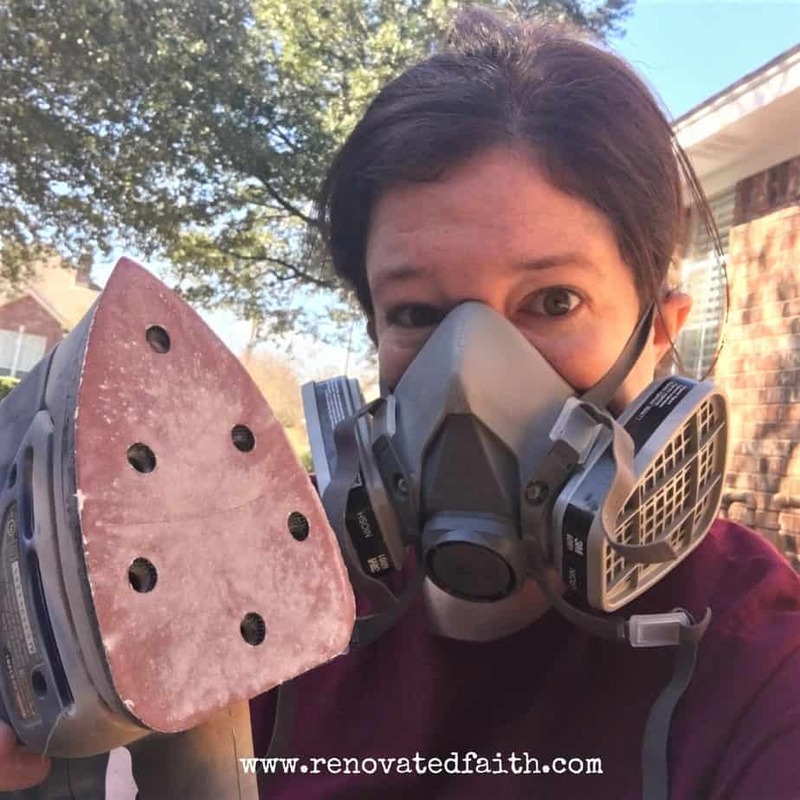 Make your holes before you paint because you don’t want to risk screwing up the final finish. I then glued the drawers onto the inside of the desk using wax paper to ensure the glue didn’t seep onto the desk top. 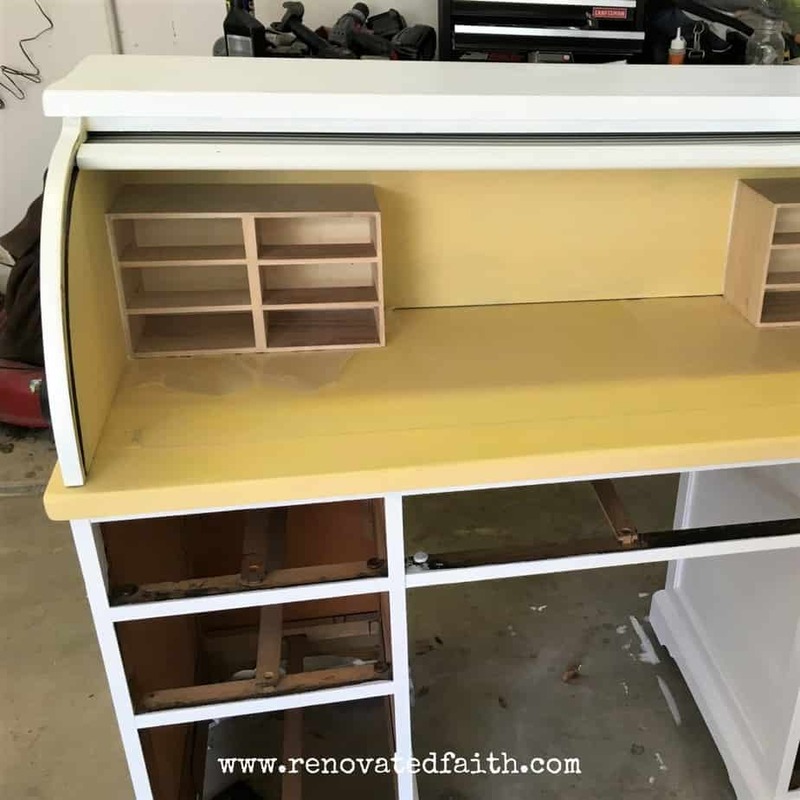 I started painting the desk with the yellowish base coat on the places I would faux stain and used white on the rest. It took a couple coats of white paint because the desk was so dark. 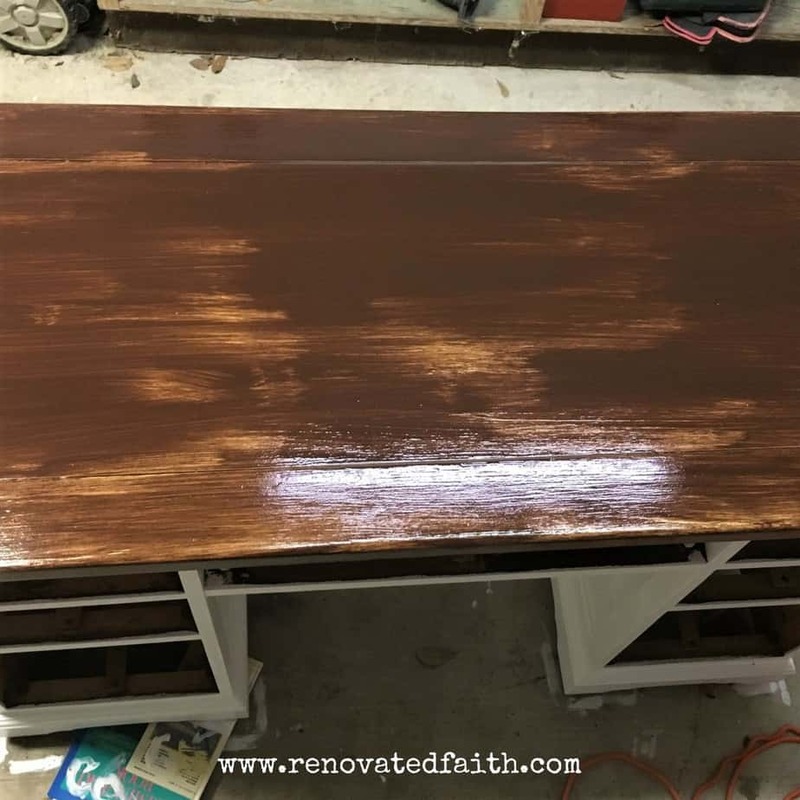 I used the same process on this desk as I did with the end tables in my post How To Gel Stain Wood Here is a pic of the first coat of gel stain. 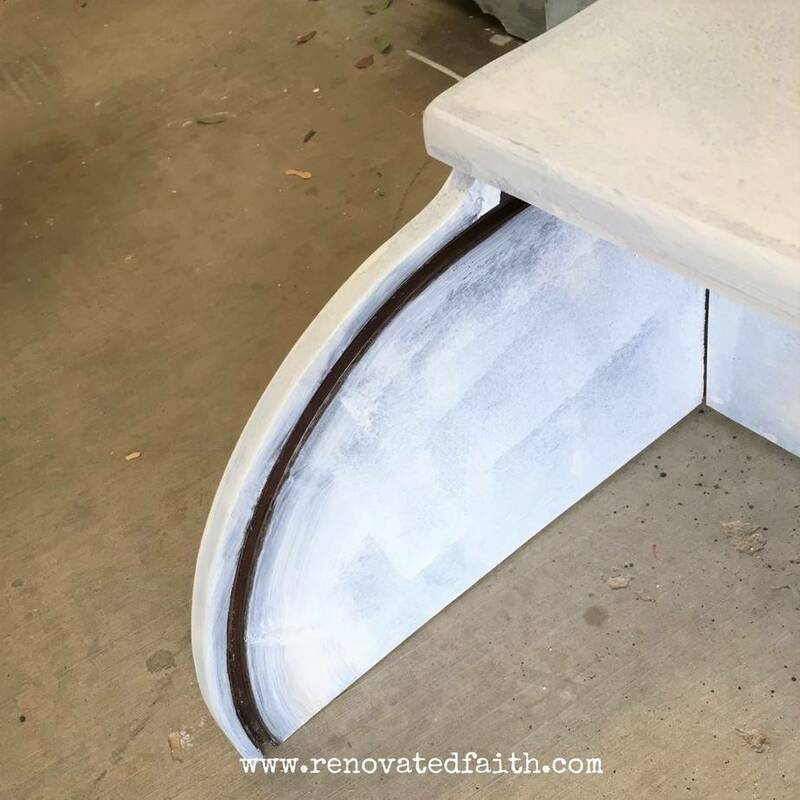 You want to leave some sections only partly covered in the first coat to make the second coat a little more translucent and “wood-grain-like” in those parts. After the second and final gel stain coat, I added a coat of wipe-on polyurethane to the stained parts. 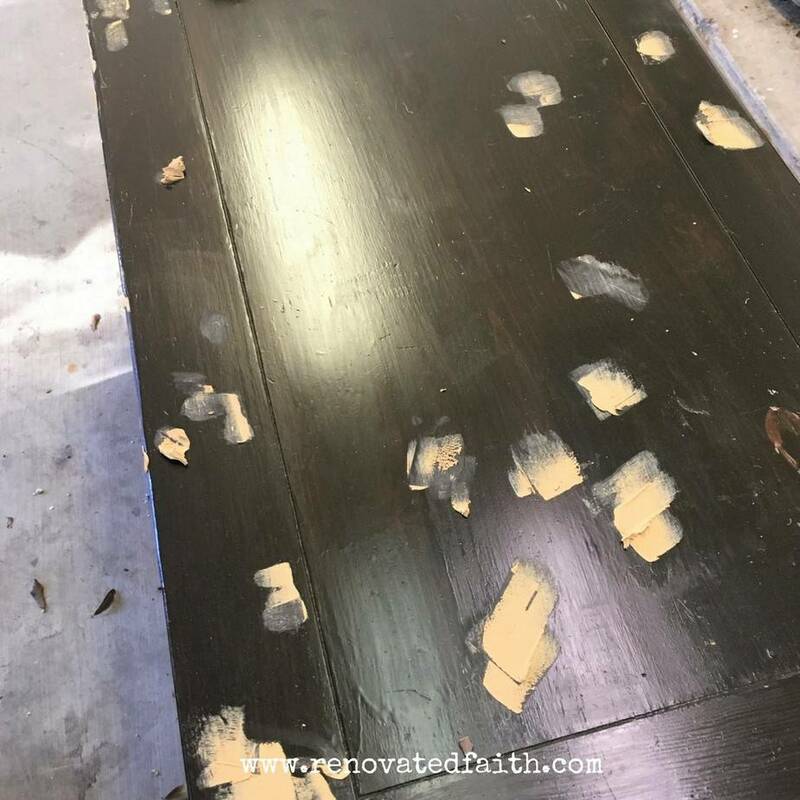 The nice thing about latex paint and polyurethane is that you know that in 10 years the finish will look the same and be just as durable. 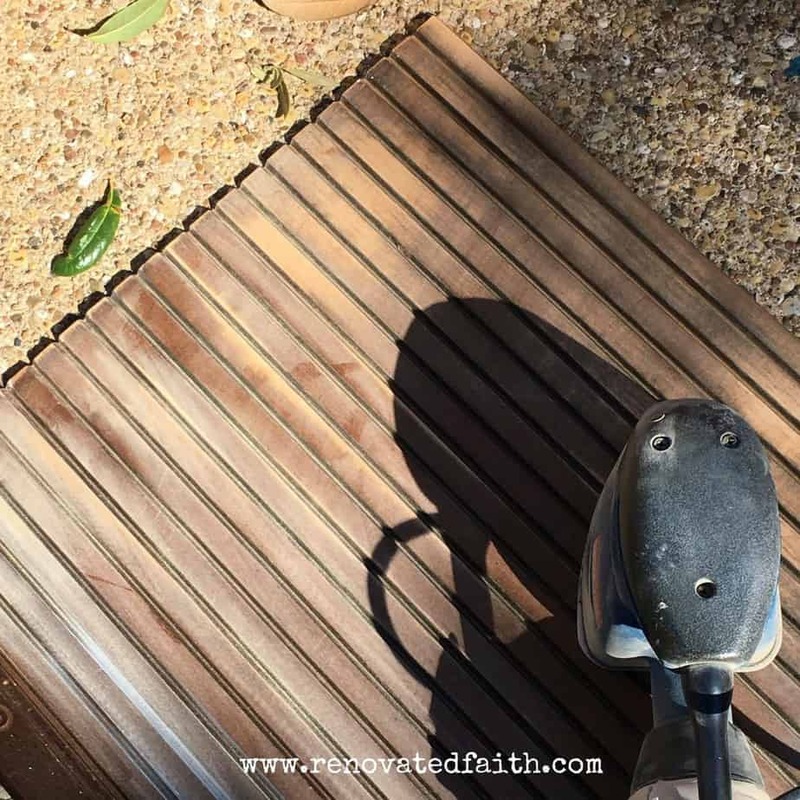 Both finishes provide a clean, wipe-able surface that will not hold dirt easily. After touching up the tambour one last time, I put the desk together including the main drawers, the top and the tiny drawers. 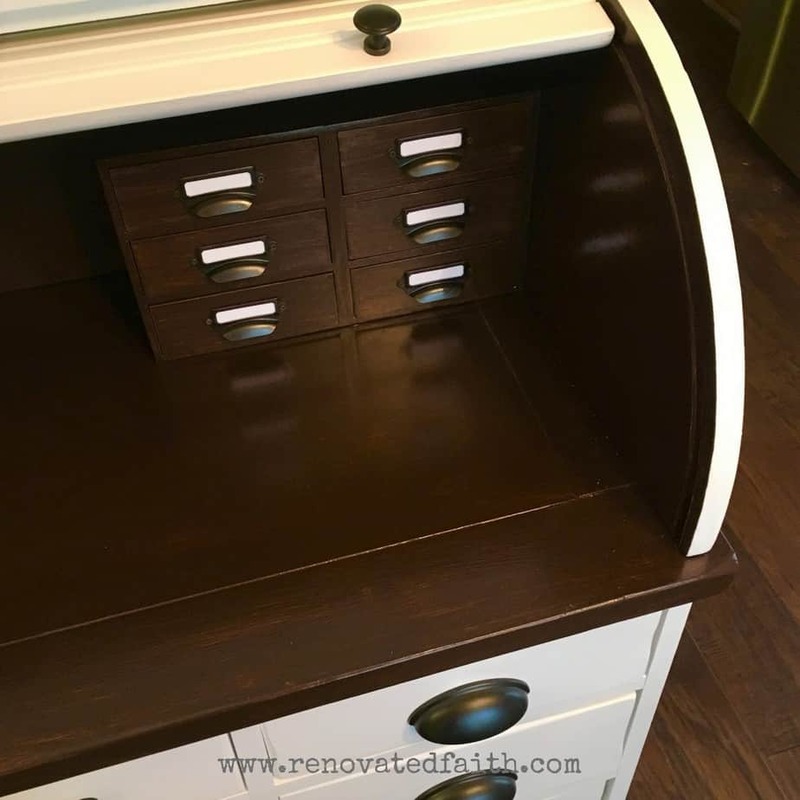 I also added new hardware to the whole desk including ‘card catalog’ style drawer pulls to the top drawers. Didn’t they turn out cute? Notice the concrete floors in the background. We had a massive flood which I shared about in my post Beauty From Chaos: How to Find Peace in Any Situation. 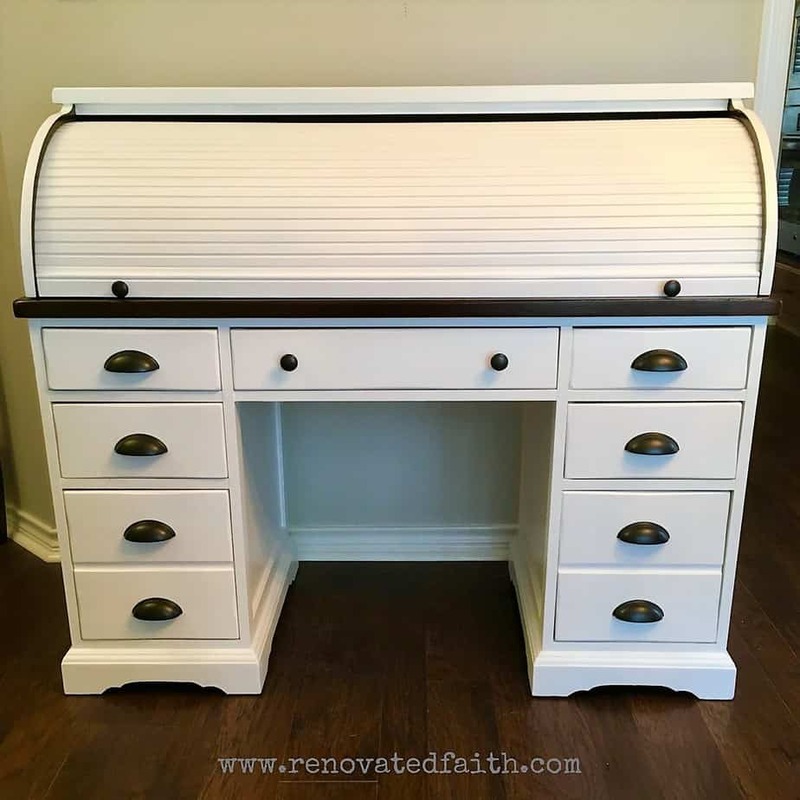 This desk was quite an undertaking but worth it to bring out the full potential of such a fabulous vintage piece. 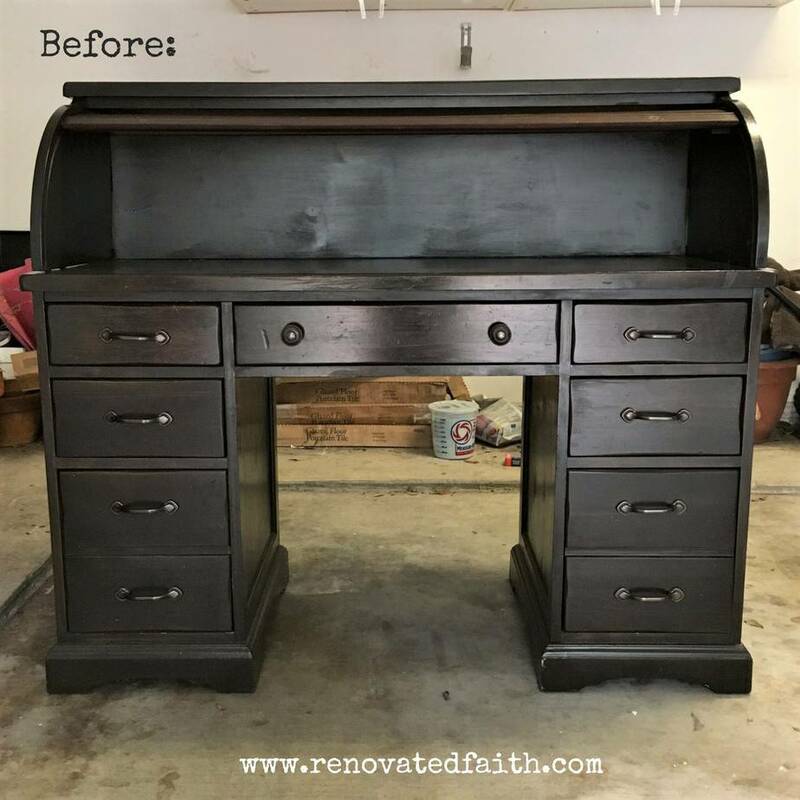 Thanks for stopping by and be sure to check out my other furniture transformations! What a beautiful piece. I really enjoy looking at all the pictures of your makeovers. 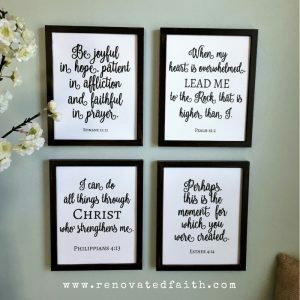 They are inspirational and make me want to refinish something. Wow! It’s gorgeous. I like the little boxes you added inside, too! This is stunning! I love the step by step process! I would also love to have one of these desks! You do beautiful work. You also have given me some courage to finish some of my projects. I did a table in chalk paint with wax over it and I do not like it. 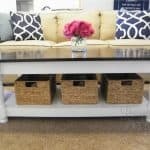 I would love to redo with a faux stain like you did on the top and white on bottom. How do I do that with wax already on the top? 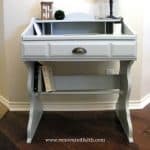 Maybe just chalk paint it again and then enamel paint over that? Love your website! Yeah, you might just delete it for a time and see what you learn about yourself and any potential addiction. I have my facebook app back on my phone but the period of time I deleted it made me more aware of what tendencies are healthy and which aren’t. Thanks for reading Enid! I can’t seem to find any information on how to take the top off the desk. I want a flat desk to accommodate my laptop because the rolltop isn’t tall enough to keep my laptop open. How did you remove it? We plan to store the top and put it back on when we’re ready to sell it. Thanks for your help.